Answer: A and D. The network layer defines logical addressing, in contrast to physical addressing. The logical address structure allows easy grouping of addresses, which makes routing more efficient. Path selection refers to the process of choosing the best routes to use in the network. Physical addressing and arbitration typically are data link layer functions, and error recovery typically is a transport layer function. Answer: C and E. Because PC1 and PC2 are separated by routers, the PCs must rely on the routers to use routing logic. With routing, the router discards the data link header of an incoming frame, making a decision of where to forward the packet deencapsulated from the frame. As a result, the largest entity that passes from PC1 to PC2 is the IPv4 packet (or IPv6 packet), which goes by the more general name of L3PDU. Q3. Which of the following is a valid Class C IP address that can be assigned to a host? Answer: B. 224.1.1.1 is a Class D address. 223.223.223.255 is the network broadcast address for Class C network 223.223.223.0, so it cannot be assigned to a host. Q4. What is the assignable range of values for the first octet for Class A IP networks? Answer: D. The first octet of Class A addresses ranges from 1 to 126, inclusive; Class B, 128 to 191, inclusive; and Class C, 192 to 223 inclusive. 127 is technically in the Class A range, but it is a reserved address used as a loopback. Answer: D and F. Without any subnetting in use, all addresses in the same network as 10.1.1.1—all addresses in Class A network 10.0.0.0—must be on the same LAN. Addresses separated from that network by some router cannot be in network 10.0.0.0. So, the two correct answers are the only two answers that list a valid unicast IP address that is not in network 10.0.0.0. Q6. Imagine a network with two routers that are connected with a point-to-point HDLC serial link. Each router has an Ethernet, with PC1 sharing the Ethernet with Router1 and PC2 sharing the Ethernet with Router2. When PC1 sends data to PC2, which of the following is true? a. Router1 strips the Ethernet header and trailer off the frame received from PC1, never to be used again. b. Router1 encapsulates the Ethernet frame inside an HDLC header and sends the frame to Router2, which extracts the Ethernet frame for forwarding to PC2. c. Router1 strips the Ethernet header and trailer off the frame received from PC1, which is exactly re-created by Router2 before forwarding data to PC2. d. Router1 removes the Ethernet, IP, and TCP headers and rebuilds the appropriate headers before forwarding the packet to Router2. Answer: A. PC1 will send an Ethernet frame to Router1, with PC1’s MAC address as the source address and Router1’s MAC address as the destination address. Router1 will remove the encapsulated IP packet from that Ethernet frame, discarding the frame header and trailer. Router1 will forward the IP packet by first encapsulating it inside an HDLC frame, but Router1 will not encapsulate the Ethernet frame in the HDLC frame, but rather the IP packet. Router2 will deencapsulate the IP packet from the HDLC frame and forward it onto the Ethernet LAN, adding a new Ethernet header and trailer, but this header will differ. It will list Router2’s MAC address as the source address and PC2’s MAC address as the destination address. Q7. Which of the following does a router normally use when making a decision about routing TCP/IP packets? 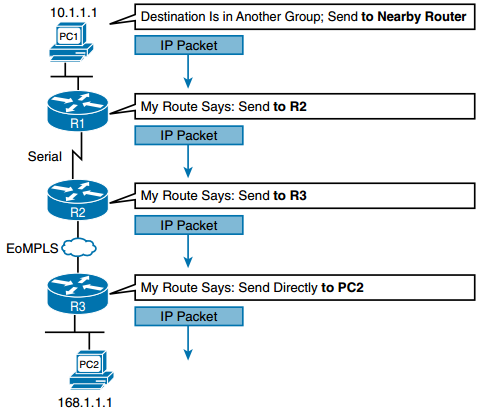 Answer: C. Routers compare the packet’s destination IP address to the router’s IP routing table, making a match and using the forwarding instructions in the matched route to forward the IP packet. a. The host always sends packets to its default gateway. b. The host sends packets to its default gateway if the destination IP address is in a different class of IP network than the host. c. The host sends packets to its default gateway if the destination IP address is in a different subnet than the host. d. The host sends packets to its default gateway if the destination IP address is in the same subnet as the host. Answer: B and C. IPv4 hosts generally use basic two-branch logic. To send an IP packet to another host on the same IP network or subnet that is on the same LAN, the sender sends the IP packet directly to that host. Otherwise, the sender sends the packet to its default router (also called the default gateway). Answer: A and C. Routers do all the actions listed in all four answers. However, the routing protocol does the functions in the two listed answers. Independent of the routing protocol, a router learns routes for IP subnets and IP networks directly connected to its interfaces. Routers also forward (route) IP packets, but that process is called IP routing, or IP forwarding, and is an independent process as compared with the work of a routing protocol. Q10. A company implements a TCP/IP network, with PC1 sitting on an Ethernet LAN. Which of the following protocols and features requires PC1 to learn information from some other server device? Answer: C. Address Resolution Protocol (ARP) does allow PC1 to learn information, but the information is not stored on a server. The ping command does let the user at PC1 learn whether packets can flow in the network, but it again does not use a server. With the Domain Name System (DNS), PC1 acts as a DNS client, relying on a DNS server to respond with information about the IP addresses that match a given host name.